With the departure of Jessica Breland the Sky currently has a void at the starting power forward position. How to fill that position will be determined by who they believe will be the best candidate to fill that need. The question moving forward for the Sky coaching staff will be who do they envision should be the best person to fill that need? A. Do they believe the best person to fill that position is currently on the roster? B. Do they believe the best person to fill that position is a member of the 2018 draft class? C. Do they believe the best person to fill that position is a member of the 2019 draft class? D. Do they believe the best person is a current pro player that they need to make a trade to acquire? How they respond to the above questions will determine what action they need to take to address their power forward need. There's no PF worth drafting at #3/#4. After Wilson, the next best PF is Billings, but she's not worth taking over DeSheilds, Williams or any of the three PGs(Canada, Brown, Nurse). I wonder if they might have Williams at PF in the beginning of the season. Chicago can get a post player without using one of their lottery picks to attain that player. They can trade up and get a high second round pick. There are four options Chicago have in front of them. They just need to chose one. I stopped writing mock drafts years ago. I prefer draft rankings for my favorite team, the Chicago Sky. This is my rankings for the 2018 draft class. If the Sky can draft three players from my list above I will be a happy Sky fan. You should be happy then. They should be able to get two out of that first group with #3 and #4. Since CHI doesn’t have a second round pick unless they trade for one, that second group of players should be out of play unless Stocks over-reaches with #3 or #4. One of those in the last grouping should be available with #28. The key sentence in your response is Chicago trading for a second round pick. That is a possibility. !!! DO NOT TRADE EITHER PICK !!! Yeah Chicago would be pretty dumb at this point. They could end up with Mitchell & Deshields. Azura Stevens would be the perfect replacement for Breland and would be a great complement to Dolson in the Sky's frontcourt. The only reason to make a trade is to get Stevens at #2, to make sure Indiana does not take her. They add Mitchell and Williams, IMO. Mitchell can cover the 1/2 and Williams the 3/4. DeShields could drop as low as #7 now if Seattle takes a PG. Or Williams could drop as low as # 7 . Its really a toss up between the 2. CHICAGO -- The Chicago Sky have named sigur3 general manager of the Chicago Sky. Michael Alter explained "Amber Stocks does not want to be mocked on RebKell's again for her drafting for a second straight season, so she felt like it was the right time for her to hand over general manager duties to one of the message board's esteemed talent evaluators instead". 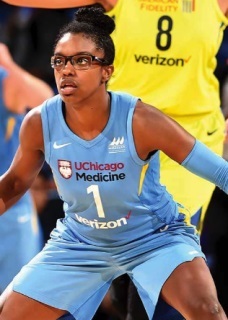 Amber Stocks said "It will be an honor to be able to work with sigur3 in order to build the Chicago Sky into a WNBA championship contender." The Sky will host opening night at Wintrust Arena on May 20 against the New York Liberty. Season ticket memberships and mini plans are available now at sky.wnba.com/memberships or by calling (866) SKY-WNBA. You made a lot better effort on that Foolish post over yesterday’s official one. You are right Myrtle. I am a happy man right now because I just found out that A. Stevens has declared for the 2018 WNBA draft. I just did a somersault and a back flip kind of happy! OH HAPPY DAY! If Pokey sticks with her plan and draft Mitchell I see Chicago taking Stevens and Deshields (or Gabby but I think the coach likes scorers). On the flip side Indy takes Stevens Chi gets Mitchell and G. Williams (thought I would flip it from Deshields for the Chicago fans that prefer Williams. Also Chicago might like some more Defense on the perimeter to compliment Mitchell). "Don't do something until you get it right, do it until you can't do it wrong." The bonus for the Sky passing on Mitchell at #2 is the likelihood of one of Nurse, Brown or Canada dropping to #8 now. Fever take Stevens. The personal interviews should be an important component to whom the Sky draft with the #3 & #4 picks. They should draft players who are willing to be coached outside of their comfort zones. They should also draft players that want to make a long term commitment to play for the Chicago Sky. Not sure if Ndour will even show up. If she doesn't, this is an easy call. Not sure what’s happening here. Seems like a mess to me. She was re-signed back in February, so I have to believe she plans to show up.